It may be a Joy to wear it! FARMINGTON - What does the hit TV comedy series My Name is Earl have in common with Farmington? Yes, correct, both feature life on the wild side in trailers, but apart from that? Give up? Well, last week, the wardrobe department of Twentieth Century Fox Studios in Van Nuys, California e-mailed the town’s best known cartoonist, Stephanie Piro, asking for permission to use one of her T-shirt designs in an upcoming episode of Earl, to be aired next month. Which T-shirt, you ask? The one of a crazed cat with zonked-out eyes, gripping tenaciously onto a catnip mouse while insisting, "Catnip? I can give it up any time!" 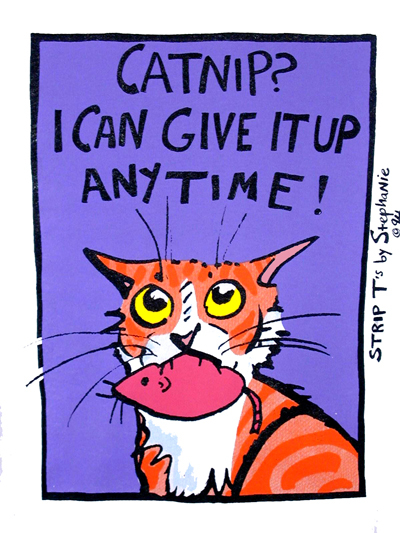 Stephanie drew this cartoon back in the early 1990s, and over the years the T-shirt has achieved minor cult status among alternative lifestylers, hippies and downright freaks, who have developed the bizarre notion that catnip is a codeword for something else that we won’t go into here. Anyway, it seems that someone from the California studio went to a cat show the other day, and bought the Catnip shirt at a booth, knowing that My Name is Earl was just about to embark on filming an episode with a cat theme. Tracing Stephanie, via her signature on the shirt, to her website (stephaniepiro.com) they zipped off an urgent request to have a character in the show wear it, hinting that the person might be Earl’s ex-wife, Joy, who lives in a mobile home park and who acts either like she is either a laid-back catnip user or an edgy flake whose secret stash of the herb has just run out. Stephanie, as it happens, is a big fan of Earl, and has not missed a single episode of the show, which was launched only last fall and became a surprise hit, nationally. She’s looking forward to the second season, that starts later this month, and particularly to the Oct. 12 show, when her T-shirt will debut - unless, of course, some Twentieth Century Fox producer has suddenly reached the horrifying conclusion that there is more to "Catnip" than meets the eye, and has hit the big red panic button. I would like to wish a belated farewell to Mr. Allen Drew, a short but upright citizen, who passed away recently. He served as town selectman for several years, although he may be best remembered for his long-time dedication to the town flagpole, up and down which he hauled the flag of the United States on a daily basis for decades. Though his patriotic task was largely an unsung one, Allen was motivated not by a need to be appreciated but by a veteran’s lifelong sense of duty. All he ever asked was that the town give the pole a lick of white paint now and then, although, back in the days before 9/11 aroused patriotic fervor from a deep slumber, it was often more likely that a Biblical camel might pass through the eye of a needle. Sometimes, it seemed that Farmington Corner was his only ally in the battle against flaking paint and creeping rust. Back in 1989, despite there being $600 in the town budget for Patriotic Purposes, selectmen debated for weeks (without reaching a decision, naturally) about whether to accede to Allen Drew’s request for a new flagpole rope. With Memorial Day fast approaching, he gave up waiting and paid out the $18 from his own pocket, with another decent citizen, Roger Belanger, offering to split the cost with him. "Yup, there no doubt about it. Farmington has the rustiest old flagpole for miles around - probably the worst in the state - and while all kinds of folks think it a public disgrace, the town officials are rustier still when it comes to springing into action, citing low funds and high risks. Don't they know that "paint" is a five-letter word that appears in most dictionaries pretty close to "patriotism?" I was moved to rewrite an old Civil War song. Shouting the battle cry of "Paint it!" Yelling, "It's a disgrace, buddy, ain't it!" These stirring lines were then followed by a history of the flagpole as supplied by the only Farmington artifact that had been on the Square longer - barber Rufus Rundlett. With less than a week to Memorial Day, Allan still clung to the hope that the rusty old pole would somehow get sandblasted, undercoated and given a good coating of white auto enamel, and to bolster his faith, the Historical Society and the Woman's Club each pitched in $100. But the Fire Department of that era declined to volunteer its manpower or its ladder truck and spokesman put it succinctly. And then, against all expectations, Allen Drew’s belief in a Memorial Day miracle proved justified. Firefighters from Rochester Fire Department, placing patriotism ahead of protocol, as it should ever be, snuck over in their ladder truck and did the job. Since that time, Farmington’s patriotism has caught up to, and probably surpassed, that of Rochester, as evidenced by the small American flags attached to lighting poles along Main Street, which flutter in marked contrast to the Lilac City’s rather ugly commercial contribution to downtown décor. That said, I heard a rumor the other day of Farmington’s flagpole being considered for relocation on account of its inconvenient location vis-à-vis public services wires and transformers. Let Farmington Corner speak for the late Allen Drew and state that wires should be forced underground and flags should be publicly displayed. Not the other way around. And I know he’s watching!